It’s been about 4 months now since I was able to get my hands on the Embody — Herman Miller’s latest flagship work chair — and now I feel like I’ve spent enough time in it to give a proper review. The Embody seems to be the logical successor to the throne of the ubiquitous Aeron chair and I have to say it’s a worthy one. I’ve had various repetitive stress related injuries throughout the course of my career so I’ve always been very sensitive to ergonomics. I’ve had Aerons and various other chairs but I’ve never really been truly satisfied with any of them. So it was with a healthy dose of skepticism that I approached my experience with the Embody. Before I got the Embody, I had a hard time finding any definitive information as to whether it did in fact live up to the initial hype surrounding it’s release. I guess chairs are pretty subjective, there’s never really a one size fits all solution. I heard a lot of people debating whether it was better than the Aeron and Humanscale’s Freedom Chair, and still more debating whether it was worth the decidedly high price point. But everything I had read pretty much went out the window when I sat in the Embody. It really is as incredible chair, it’s the first one I’ve had that I’m not constantly aware of. It acts almost as an extension of your body allowing for much longer periods of sitting without the common issues I’ve had with most chairs in the past. The unique seat back isn’t just there for looks, it does wonders for my back which was usually the biggest issue when working for extended periods. The arms are very flexible and can be easily dialed in for a perfect height which goes a long way to alleviate wrist pain issues. All in all, the fit and feel are top notch and honestly like nothing I’ve ever experienced. The bottom line is that this chair allows me to work longer and focus better. And the Embody is definitely a step up from the Aeron and light years beyond the Freedom Chair (which I really don’t like at all) or the Mirra (which many recommended as a cheaper alternative to the Embody). As much as I love the Embody I do have a few issues with it, none are deal breakers for me, but you should be aware of them if this chair is on your short-list. First up is the design. Yes, I ordered the orange/white which in retrospect was a mistake. It can really overwhelm the space visually. The chair is also rather large so between that and the color, it certainly is a presence in the room. I have since seen the black on black version which is much more subtle and highly recommended. Second is the mobility of the chair. In the studio I have to move around from station to station a lot and the sheer weight of the Embody makes this difficult. The thing is build like a tank which is great for durability, but it’s not a chair you’re going to be gliding around the office in. Or course, this would be less of an issue on hard surfaces, but the downstairs at the studio is carpeted and you almost have to get out of the seat to move it around. I do have the optional chrome base and I would imagine the standard plastic base is a bit lighter. Finally, at around $1100 (which is at least better than the insane introductory price of $1700 and can be much less with an industry discount, see below) it is prohibitively expensive. But as they say, “buy it nice or buy it twice”. As someone who makes a living sitting in a chair all day it’s not hard to justify spending a chunk of that living on a high quality chair. It allows me to get more work done and avoid injuries that in the past would put me out for a while making it well worth the premium. All things considered the Embody is a huge winner in my book. 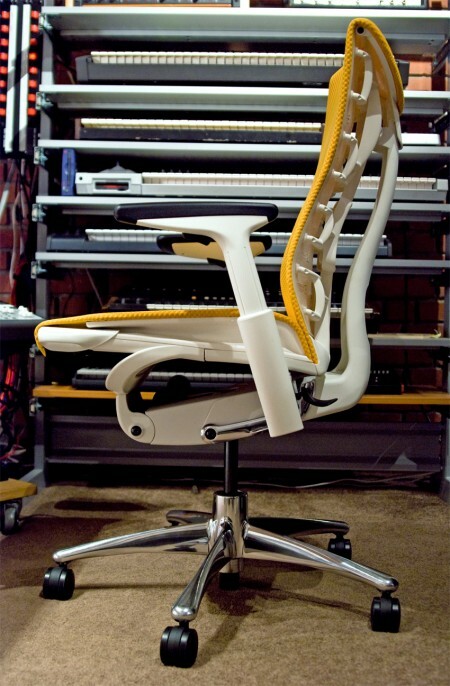 It’s the most comfortable and functional chair I’ve ever used and will be in my studio for a very long time. I am told that discounts are available on the chair through Herman Miller. I got mine direct and at the time they had a promo deal going on that brought the price down to $800 fully loaded. You might try contacting them directly to find out whether they have any promotions going on or whether you can get a designer discount. 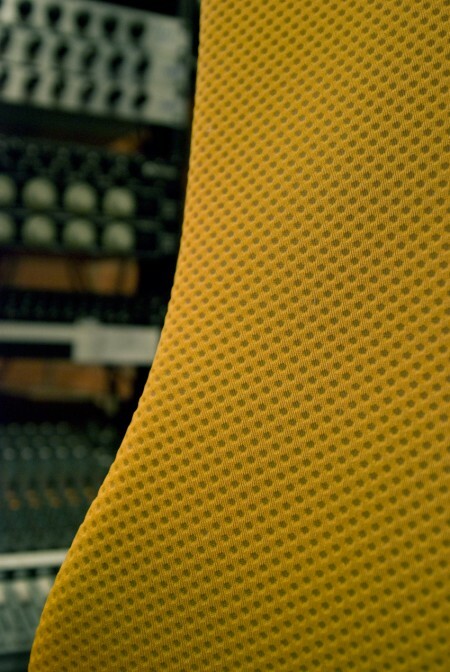 Herman Miller Cognita Herman Miller Why Desig.. What I Really Wanted Fo.. This is an unexpected, but certainly very welcome review! I found this chair a while back while browsing on their website, and living in France I did not have the chance to give it a try. However I’ve been really wondering how good it could be. I’m really glad I can finally read a good review of it. Like you, and many of the other people who read your blog I believe, I spend most of my day sitting on the same chair… And coupled with my Japanese bed, I believe my back will be destroyed in a few years. Jesus! For that price I hope it’s a good chair. 1400€ down here. But it looks pretty good I wish I had one. Thanks for the review Scott. Been thinking about investing in a nice chair, but the price tag seemed pretty steep. Nice to hear your thoughts on it opposed to just the marketing hype from when the chair was released. What didn’t you like about the Mirra? Thats a really nice looking chair. Very nice chair. Very nice review: thanks for sharing your information with us. Did you use a designer discount when you bought the chair? 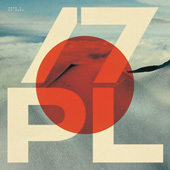 I don’t know how much Graphic Designers get, but I know Architects get 45% off. Just letting people know, encase they were unaware that designers get discounts. Thanks for the review, I’ve been really curious about these since they first came out. I think it’s pretty awful looking, but function is definitely the more important part when it comes to chairs. chair? what chair? all i see is a tower of awesome synths…. After reading this review I have a far better comprehension of how much my 7-year old gnarly desk chair leaves to be desired. If only I could afford the Embody’s financial onslaught! Thank you for your dependable product reviews, Scott. I am currently palming the Logitech Performance MX and I am thoroughly satisfied! It’s been rumored that Herman Miller explored using some type of replaceable carbon filter in the cushion of the Embody and other chairs, but the approach was scrapped after their marketing department didn’t feel they could appropriately and tastefully promote that feature. They’re crazy as far as I’m concerned; it was a forward thinking idea that would have solved a big problem. We met in Seattle once, love reading the blog and checking out the music. Keep it up. Yeah, that’s always an issue, but the arms can be adjusted down pretty far and also tilted outwards. In that position it works pretty well. Sure, you have to do all that adjustment, but the way the system works makes it really quick so it’s not a big hassle. But that’s just for quick stuff, when I’m recording guitars I use a stool anyways. Yeah, that’s always an issue, but the arms can be adjusted down pretty far and also tilted outwards. In that position it works pretty well for guitars. Sure, you have to do all that adjustment, but the way the system works makes it really quick so it’s not a big hassle. But that’s just for quick stuff, when I’m recording guitars I use a stool anyways. Nice review. 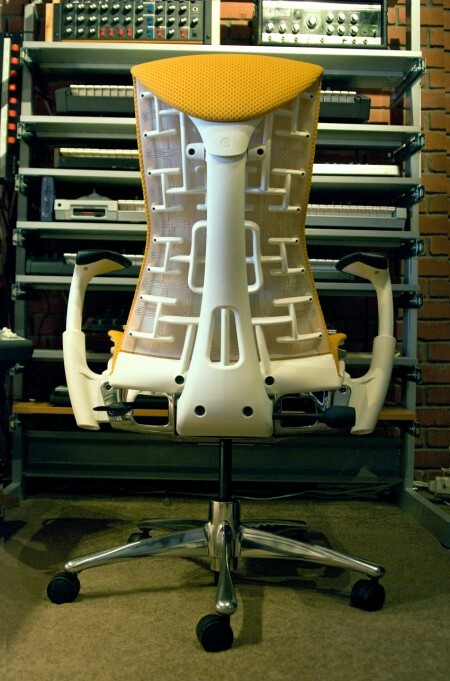 Here in EC that chair costs 2150$, and the Aeron costs 1200$, it’s a shame confort can only be had by the rich! When you were looking at chairs, did you consider the Niels Diffrient Freedom Chair? If so, what swayed you away from it? Nice review – Im sure its lovely to sit in – but I dont really like the look of it. The Mirra chair is half the price of an Aeron and is twice a comfortable. The Mirra uses cheaper materials, which is no secret, but the newer design obviously gives it a huge advantage over the Aeron. If you were thinking about the Aeron, Id say go for the Mirra. I’d love to pick up a new chair but there’s a major issue that I wondered if you would comment on: do you ever sit down to play guitar in yours? I’ve found it’s somewhat difficult to find even inexpensive desk chairs without arm wrests. 99% of the time at home I’m sitting in front of my desk with my guitar while recording. I know from your studio photos that your guitar isn’t too far away, so just wondered where you typically play guitar when recording – standing up? Another chair? Yeah, that’s always an issue with armed office chairs, but the arms on the embody can be adjusted down pretty far and also tilted outwards. In that position it works pretty well for guitars. Sure, you have to do all that adjustment, but the way the system works makes it really quick so it’s not a big hassle. But that’s just for quick stuff, when I’m recording guitars I use a stool anyways. A while ago, I had the chance to try out the Embody for a week and even though I loved it when I first sat in it, in the end it wasn’t for me unfortunately. You mentioned that the seat back is so comfortable, but I have to say, to me, after a couple of days I noticed myself avoiding the chair in a way. I was always shifting around, trying to find a comfortable position. So I guess, like you said, chairs are a very subjective thing. The chair has this support for the lower back area and that started to dig into my back. I would’ve been glad to spend a large sum of money on a great chair, but to me the Embody didn’t deliver. hey scott, is that YOUR towering inferno of synths behind the chair? I never really think about chairs when I’m in my office. Now I wonder how much of an impact a chair like this would have on me. I would definitely love to invest in this. Maybe after I graduate I’ll treat myself. I’m looking in to getting the Embody as well. Been having some major back issues lately and I think it’s about time I spend the money on a nice chair. Scott, would you say it’s the color of the fabric that makes it stick out so much, or the frame color?Like, would getting the white frame with a darker fabric be toned down enough for you? So is this like the Freedom chair where there is a limited amount of adjustments and you just lean back to recline? Also, isn’t that chair yellow, or do I need to get my monitor/eyes/brain checked? That chair looks pretty cool, I love the bright punch of yellow it gives. but the main point here is get whatever chair you need to bust out the new Tycho album and pronto!!! In person it’s more orange-ish, and I think that’s how they describe this colorway on their site. Yeah, I think the body and the fabric work together to make it stand out. Black/black seems like the way to go. It’s kind of freaking me out because I’m really lax about my monitor calibration and color management but on my monitor it looks exactly the color of a ripe banana. Then again, for a long time I also thought your site had a solid black background! That chair is amazing and after this college thing is over and I am done paying debts I am going to look into that chair or whatever comes after it at that point. And I agree with Brendan above about the studio gear. Every time you show us a picture of your studio I want to know everything about it! Maybe a “rack by rack” series? I’m a gear nut and love that sort of stuff. Oh man I wish I had to money to get a good chair. I am a graphic design student and at my work, I do design too so these couple of years, I have spent a lot of time in my chair. My lower back has started to take the toll too. 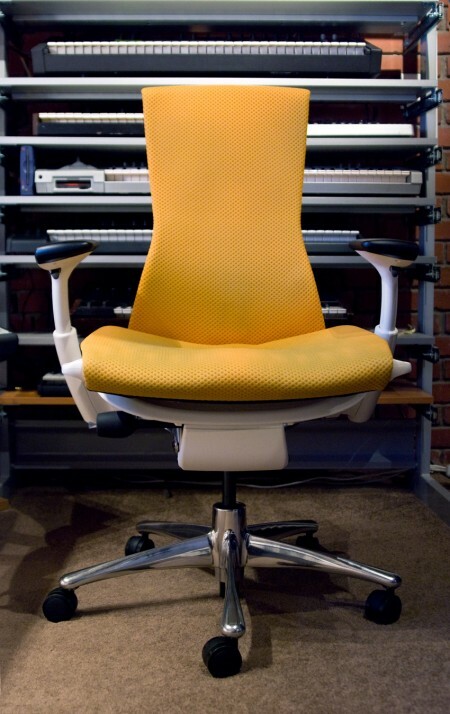 What company makes a decent economical and ergonomical chair for around $100-$200? 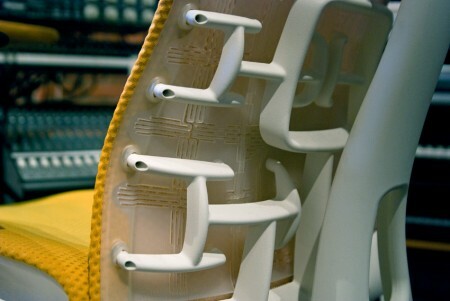 It’s also worth noting that the Embody chair adheres to the Cradle to Cradle environmental protocol. Made of 42% recycled content, the Embody chair contains no PVCs; at the end of its lifecycle, 95% of Embody can be recycled. Plus, as you mentioned… “buy it nice or buy it twice”… probably the most sustainable thing you can do. After first hearing about the chair on your website, I checked the Embody out when I was looking for an ergonomic chair. Having recently been in a car accident and suffering from neck and back pain this chair seemed like it would help with my recovery sitting at a desk all day and into evening at work. I tried out over 40 different ergonomic chairs and the Embody was the best fit for my injuries. Between your recommendation, my phyiscal therapist’s advice, and sitting in the chair myself, I wholeheartedly agree with the endorsement. I just bought the Emobdy for my office earlier this week and very happy with the purchase. Thanks for the review. Also, I love Coastal Break. Can’t wait for the new album to come out. @Scott have you noticed any issues with sonic reflections when working on music? i’ve had problems on executive leather chairs, seems like this wouldn’t be a problem but just wondering . . also, how easily does the base come off? (for transport) ? I’ve had the chair for over 8 months now, and I agree: the chair disappears. It’s fantastic if that’s what you want. If you want a big, comfy, leather cushioned one that will embrace you and feel like a big marshmallow, then steer clear. You will not feel this chair, it vanishes. At my end, I love it. I got over 50% discount when I bought it in July 09, so definitely do some shopping around. I’m ready to take the plunge and get a hold of one of these, but i could use some more information about the discount you mentioned. 1) Who offers a discount. 2) Do they discount ‘graphic designers’, or only architects and interior designers? Thank you for the review Scott. It is always helpful to read a review after a product has been tested for a few months. Warkin Equipments Pvt. Ltd. is a Manufacturers & Exporters of Oil Chillers, Oil Coolers, Air oil coolers & Water coolers in India. After having used my Embody chair now for six months I have to say I’m a bit disappointed. I’ve spent countless hours trying to adjust it to perfection but I constantly have neck strain and a tired / aching feeling in my right shoulder. I realize the shoulder issue is probably more tied to the use of the mouse but the neck strain I believe has everything to do with the chair. I’ve changed the monitor height at least a 100 times and nothing helps. I constantly have pressure and strain in the back of my neck that I never used to have prior to owning this chair. I’m also unhappy with the fact that the arm rests do not swivel and that they tend to move inward and outward too easily. All in all, I would definitely not say this chair is worth the money. I had a $50 chair from staples that I think was a bit more comfortable. I have an ergonomic specialist coming to my home office to try and help me make this chair more comfortable but after six months, I’m very unhappy. Oil Chillers Manufacturers, Oil Coolers Manufacturers, Heat Exchangers Manufacturers, Air oil coolers Manufacturers, Water chillers Manufacturers, Water coolers Manufacturers, Warkin Equipments Pvt. Ltd. is a Manufacturers & Exporters of Oil Chillers, Oil Coolers, Air oil coolers & Water coolers in India. Thanks for the review. I think I’m gonna’ pick one up… only choice to make is color… reading this, though, is scaring me straight towards the black on black… was going to go with the pumpkin on white… anyone have an opinion on this? I’m also leaning towards black on black. Most of my office is black. Papaya goes with nothing. The other thing is I think if you ever wanted or needed to sell the chair, you’d find more people interested in the neutral black/black than anything else. I see it as a resale value issue. My current office chair is black, too. I wonder though about changing the colors, how easy that would be, and how much it costs to replace the fabric. You’d have to ask Herman Miller or the dealer. I would pounce on this thing so fast if I could find it for $800. Unfortunately, with adjustable arms I can’t find it for under $1200. Wishing I had this chair right now.. I keep looking at this chair with a notion to buy it, BUT, I don’t like the pricing “scheme” (that’s a nice way to put it). For example, they want to charge $100 extra for adjustable arms, otherwise, it comes without arms. And $80 for Hard/Soft casters. Seriously, a chair with arms? It seems really ridiculous.